Wide ankles will fit over most shoes up to US Men’s size 12. Use a string or cloth tape measure to measure around your waist and compare that to our "Fits Waist" measurement. Don't rely on your "pant size" as the waist varies from brand to brand and may not actually correspond to inches. There is no zipper, so our pants are built with the waist line loose enough to come up over typical hips and fit over your normal hiking pants. There is an elastic waist band to cinch them down to any minimum size. Women with large hips may need to size up a waist size. 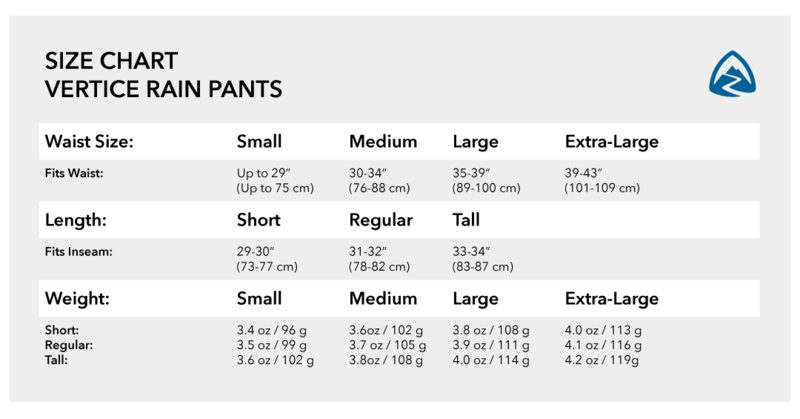 The inseam length corresponds to normal US Men's pant inseams. "I just wanted to give some feedback on my new rain pants for my section hike of the AT from Rutland, Vermont to Mt. Katahdin this summer. When I left Gentian Pond Shelter in Maine on July 12th, the rain had started. By the time I got to the top of Mt. Success it was sleeting so hard it was cutting my face. The rain pants saved me that day and performed great. I was wearing shorts underneath, but the fabric did not stick to my skin. I also wore them climbing Katahdin on August 7th. Although it was clear, the winds were a steady 70 mph and around 50 degrees. These pants saved me on both days. Thanks for a great product." "These pants are fantastic. I have hiked, bicycled and backcountry skied hundreds of miles in these pants. From rocky trails in freezing rain at 30 mph to sunny wet powder ski days these pants have seen it all and shrugged it off. In several inch rains from Washington downpours they do get damp but do not transfer water to your under layers. They are so light that sometimes I forget I have them on. The inseam options are quite helpful for mobility and fit."